fraud | ..::popular spanish practices::.. The Spanish royal family was battered by further scandal on Tuesday when the youngest daughter of King Juan Carlos was named as a formal suspect in a long-running corruption inquiry. Princess Cristina, 48, has been summoned to answer allegations of money laundering and tax evasion. The princess would be the first member of the king’s family to appear in court since the restoration of the monarchy in 1975. The charges relate to alleged embezzlement by her husband, Iñaki Urdangarin. The former Olympic handball player and his business partner, Diego Torres, are accused of siphoning off €5.8m of public funds.The money was allegedly funnelled through their not-for-profit Instituto Nóos and their family business Aizoon, of which Cristina is co-owner. While Infanta Cristina is hiding in Suiza from Justice, the show goes on in the Spanish Circus.Investigating authorities allege that Iñaki Urdangarin (Duke of Palma), his wife Cristina de Brobón (Duchess of Palma and King’s daughter) and his former business partner Diego Torres funneled about 5 million euros ($6.4 million) in public funds to companies they controlled. The three ran a nonprofit organization called the Noos Institute, through which the funds were channeled and of which the princess was a board member. In a court document , investigating magistrate Judge Jose Castro said the princess was a board member on two of her husband’s companies. The magistrate added there was evidence the princess was aware that her husband had used her name and status in his dealings, from which both had benefited. Castro said such evidence could lead the princess to be classified as an accomplice. But just after Judge Castro formally named the princess as a suspect in his investigation, the prosecutor began acting as defense counsel for Princess Cristina. It took them only a few days to get the Princess out of any issue with Justice. Of course Justice is the same for everybody in the Spanish democracy. When General Franco put king Juan Carlos in charge of the Spanish Regime, they both showed the whole world the levels of democracy Spain was getting at the time. These days, many members of the Spanish Royal Family are supporting the recently created “Spain trademark” the way they know: showing the world who’s boss in the Spanish Regime. 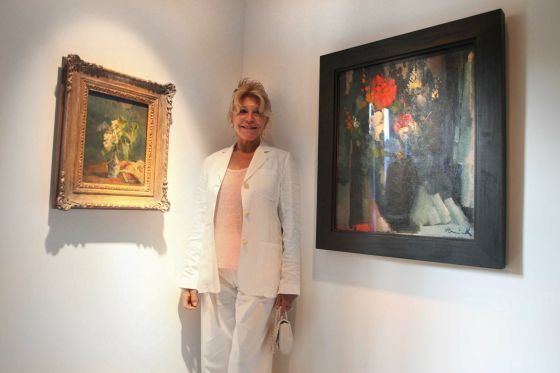 Documents obtained by the International Consortium of Investigative Journalists show how Thyssen-Bornemisza built up part of her collection buying art from international auction houses such as Sotheby’s and Christie’s through a Cook Islands company. The offshore service provider now called Portcullis TrustNet helped with the arrangements under a secretive structure that connected people in as many as six different countries, just to evade paying taxes. She leaves PP Government in its darkest hour in the history of Spain. Many say the fake sentimentality in her statement is intended only to benefit the “Partido Popular” in the upcoming elections in Galicia and the Basque Country. Countess Hope Aguirre’s popularity was at its lowest point. Less than a week ago, Hopey was attacked by a housewife with a “deadly” tupperware. Estamos en la última semana y os pedimos colaboración en la preparación de la acción. Estas son las próximas citas. Miércoles 19: reunión del grupo de Acción, a las 18h en el Patio Maravillas (c/ Pez, 21). Miércoles 19: rueda de prensa (hora y lugar por confirmar). Miércoles 19: reunión conjunta de los grupos Comunicación y Contenidos, a las 19h en Cruce (c/ Doctor Fourquet, 5). Jueves 20: reunión de grupo de Acción con asambleas y otros colectivos que estén interesados en participar en las actividades y acciones dentro del Rodeo al Congreso, a las 19h en plaza de las Descalzas. Sábado 22 y domingo 23: asamblea de la Coordinadora, a las 11h junto al Palacio de Cristal del Retiro. Yesterday, workers and unemployed people from all across Spain gathered in the capital, Madrid, to demonstrate against government lies, and asking for a referendum to decide if the country needs(or not) to ask for a bailout. 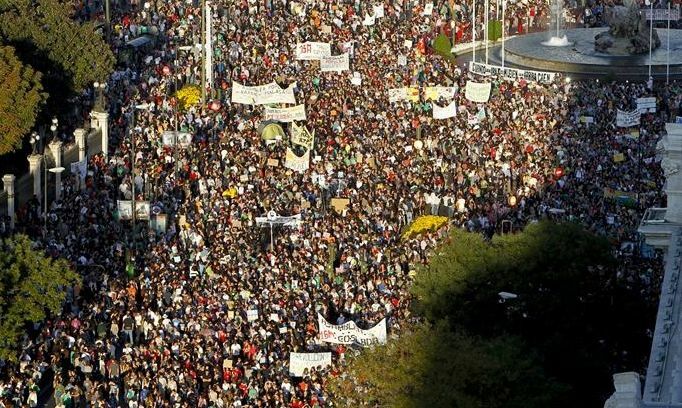 The controversy is even at the level of the disagreement about how many people went to the manifestation: the Spanish Regime says no more than 70.000 people, when sources from the police and the conveners talked about several hundreds of thousands of protesters. The protesters included police, firemen, social workers, public servants, unemployed people, teachers,health workers etc…they came from all across Spain in dozens of buses prepared for the event. In a country with a democratic tradition as brief as Spain, a referendum on this issue (or about the territorial conflicts in Catalonia and the Basque Country) could do much to improve coexistence. The problem is that this is not at all a priority for the Spanish Regime. Her last (populist) proposal has been aproved at the Regional Parliament of Old Castillia. Now the Members of the Parliament will not earn any money for their jobs as the elected charges they are. That’s not a problem if your husband is one of the richest bussinessmen in town and you live in a 2,300.000€ palace,( like is the case of Mrs. Mary Pains), but for all those people who give up their job to give full time dedication to policy, people start to think that what Mrs. Mary Pains from Cospedal really wants is NO oposition at the Regional Parliament, so nobody will be able to argue about her new regime of private non-free hospitals and private non-free schools. Of course she, and most members of her party, no need any extra payroll, they already earn much more with their own private business, but what’s gonna happen to honest Members of the Parliament? In an article called “More pain in Spain: waiting for Rajoy”, the financial newspaper blames President Mariano Rajoy for pretending that “Spain may not need a bail-out. Before taking a decision we must see whether it is really necessary,” Perhaps Rajoy is just waiting for the German Constitutional Court’s decisions, but in the meanwhile the country goes deeper into misery and unemployment (been actually the country with highest unemployment rates in the whole world). These Spanish issues have become a cancer in the heart of the European Union, dividing their members and putting an additional weight on the evolution of the whole European Community. But few Spaniards are fooled. Many talk about a political interest in delaying the decision due to the next elections in the Basque Country, where Spanish nationalists can lose all their influence in the Basque Government in favour of the Basque Democratic parties asking for their independence. This morning, four companions of the Platform Pie, who came as thousands of people to the demonstration of 15S to support the social demand that was happening in the streets of Madrid, have been detained in the square of Platerías, on the corner of the Paseo del Prado. The detention has taken place at the moment in which the companions unfolded a banner saying “25s Surround the congress ” [motto of demonstration that they convene for September 25th] to join the demo. Without being part of any criminal action, they have been arrested and accused of resistance and disobedience to authority. From the Coordinating Committe for 25S we condemn these arbitrary police practices encouraged by the Goverment against citizen’s freedom of speech and we consider them an attack to our rights, as preventive detentions are completely unconstitutional.